The word “lodge” may throw you off, so let’s get one thing straight. Deriş Bosphorus Lodge is no chalet in the mountains: it’s an apartment-style hotel in the Kabataş district of Istanbul. And forget about rustic décor and cozy fireplaces — the place is sleek, thoroughly urban, and practically brand-new. 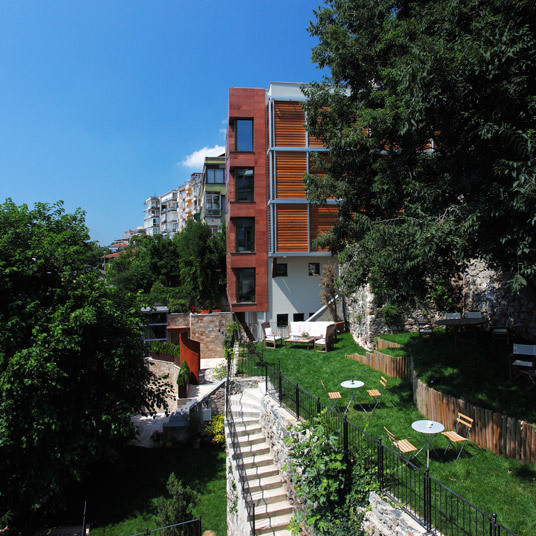 Built into a steep cliff near the shore of the Bosphorus, the hotel only contains seven apartments. Each is unique; all are surprisingly spacious, with soaring floor-to-ceiling windows, well-equipped kitchens, separate living areas with large flat-screen TVs, even heated floors in winter. The aesthetic borders on minimalist — sculptural dining chairs, long sectional sofas, smooth wood and glass, with the occasional painting or quirky houseplant adding pops of color. At the top of the line is the Panorama Apartment. As the name suggests, it offers a 180-degree view of the strait that forms part of the border between Europe and Asia. It also has two bathrooms, one with a large Jacuzzi, and sleeps up to five. All that delicious space, of course, comes at a price in a city as large as Istanbul: guests at Deriş don’t have access to the typical hotel amenities like a concierge or onsite restaurant, and they aren’t exactly in the middle of the action, but in a neighborhood that’s fairly quiet at night. But from the hotel’s doorstep, there are several ways to easily get wherever you want to go — tram, subway, the famous ferry to Princes’ Islands. And when you know you’re going to be returning to kitchen like the ones at Deriş — an urban foodie’s fantasy — you might rather bring your own finds from the Spice Bazaar back to the apartment after a day of sightseeing and feast on hummus and olives while enjoying the spectacular view in front of you. Please note: Deris Bosphorus Lodge has a 3-night minimum.